If you wish to make comments regarding this document, please send them to public-device-apis@w3.org (subscribe, archives). When sending e-mail, please put the text “orientation-event” in the subject, preferably like this: “[orientation-event] …summary of comment…”. All comments are welcome. The events introduced by this specification implement the Event interface defined in the DOM4 Specification, [DOM4]. Implementations must therefore support this specification. This specification provides several new DOM events for obtaining information about the physical orientation and movement of the hosting device. The information provided by the events is not raw sensor data, but rather high-level data which is agnostic to the underlying source of information. Common sources of information include gyroscopes, compasses and accelerometers. The first DOM event provided by the specification, deviceorientation, supplies the physical orientation of the device, expressed as a series of rotations from a local coordinate frame. The second DOM event provided by this specification, devicemotion, supplies the acceleration of the device, expressed in Cartesian coordinates in a coordinate frame defined in the device. It also supplies the rotation rate of the device about a local coordinate frame. Where practically possible, the event should provide the acceleration of the device’s center of mass. Finally, the specification provides a compassneedscalibration DOM event, which is used to inform Web sites that a compass being used to provide data for one of the above events is in need of calibration. The following code extracts illustrate basic use of the events. To get the compass heading, one would simply subtract alpha from 360 degrees. As the device is turned on the horizontal surface, the compass heading is (360 - alpha). A user is holding the device in their hand, with the screen in a vertical plane and the top of the screen pointing upwards. The value of beta is 90, irrespective of what alpha and gamma are. This specification is limited to providing DOM events for retrieving information describing the physical orientation and motion of the hosting device. The intended purpose of this API is to enable simple use cases such as those in Use-Cases section. The scope of this specification does not include providing utilities to manipulate this data, such as transformation libraries. Nor does it include providing access to low sensor data, or direct control of these sensors. User agents implementing this specification must provide a new DOM event, named deviceorientation. The corresponding event must be of type DeviceOrientationEvent and must fire on the window object. Registration for, and firing of the deviceorientation event must follow the usual behavior of DOM4 Events, [DOM4]. User agents must also provide an event handler IDL attribute [HTML] named ondeviceorientation on the window object. The type of the corresponding event handler event type must be deviceorientation. The alpha attribute must return the value it was initialized to. When the object is created, this attribute must be initialized to null. The beta attribute must return the value it was initialized to. When the object is created, this attribute must be initialized to null. The gamma attribute must return the value it was initialized to. When the object is created, this attribute must be initialized to null. The absolute attribute must return the value it was initialized to. When the object is created, this attribute must be initialized to false. Let permission be permission for relevant settings object’s origin. If permission is "default" and the method call was not triggered by user activation, then reject promise with a NotAllowedError exception and abort these steps. If permission is "default", ask the user whether sharing device orientation for the relevant settings object’s origin is acceptable. If it is, set permission to "granted", and "denied" otherwise. Set permission for the relevant settings object’s origin to permission. The event should fire whenever a significant change in orientation occurs. The definition of a significant change in this context is left to the implementation, though a maximum threshold for change of one degree is recommended. Implementations may also fire the event if they have reason to believe that the page does not have sufficiently fresh data. The alpha, beta and gamma attributes of the event must specify the orientation of the device in terms of the transformation from a coordinate frame fixed on the Earth to a coordinate frame fixed in the device. The coordinate frames must be oriented as described below. The Earth coordinate frame is a 'East, North, Up' frame at the user’s location. It has the following 3 axes, where the ground plane is tangent to the spheriod of the World Geodetic System 1984 [WGS84], at the user’s location. East (X) is in the ground plane, perpendicular to the North axis and positive towards the East. North (Y) is in the ground plane and positive towards True North (towards the North Pole). Up (Z) is perpendicular to the ground plane and positive upwards. For a mobile device such as a phone or tablet, the device coordinate frame is defined relative to the screen in its standard orientation, typically portrait. This means that slide-out elements such as keyboards are not deployed, and swiveling elements such as displays are folded to their default position. If the orientation of the screen changes when the device is rotated or a slide-out keyboard is deployed, this does not affect the orientation of the coordinate frame relative to the device. Users wishing to detect these changes in screen orientation may be able to do so with the existing orientationchange event. For a laptop computer, the device coordinate frame is defined relative to the integrated keyboard. x is in the plane of the screen or keyboard and is positive towards the right hand side of the screen or keyboard. y is in the plane of the screen or keyboard and is positive towards the top of the screen or keyboard. z is perpendicular to the screen or keyboard, positive out of the screen or keyboard. The transformation from the Earth coordinate frame to the device coordinate frame must use the following system of rotations. Rotate the device frame around its z axis by alpha degrees, with alpha in [0, 360). Device in the initial position, with Earth (XYZ) and body (xyz) frames aligned. Device rotated through angle alpha about z axis, with previous locations of x and y axes shown as x0 and y0. Rotate the device frame around its x axis by beta degrees, with beta in [-180, 180). Device rotated through angle beta about new x axis, with previous locations of y and z axes shown as y0 and z0. 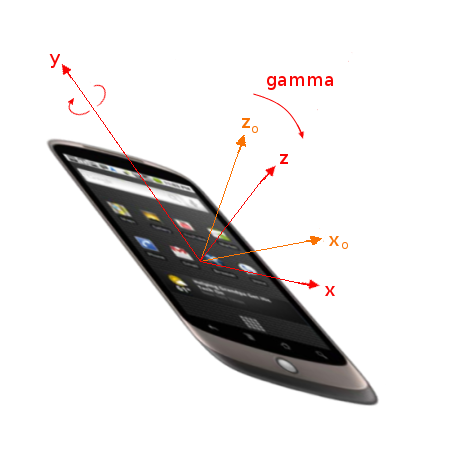 Rotate the device frame around its y axis by gamma degrees, with gamma in [-90, 90). Device rotated through angle gamma about new y axis, with previous locations of x and z axes shown as x0 and z0. Thus the angles alpha, beta and gamma form a set of intrinsic Tait-Bryan angles of type Z - X' - Y''. [EULERANGLES] Note that this choice of angles follows mathematical convention, but means that alpha is in the opposite sense to a compass heading. It also means that the angles do not match the roll-pitch-yaw convention used in vehicle dynamics. 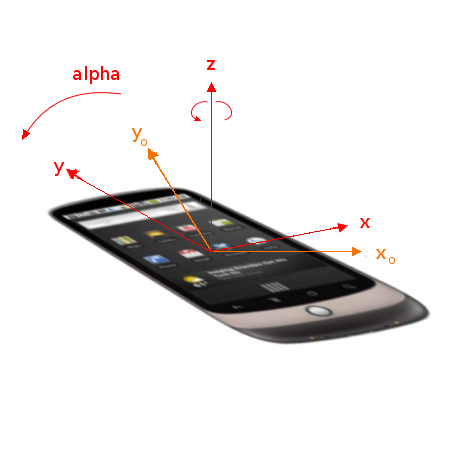 The deviceorientation event tries to provide relative values for the three angles (relative to some arbitrary orientation), based on just the accelerometer and the gyroscope. The implementation can still decide to provide absolute orientation if relative is not available or the resulting data is more accurate. In either case, the absolute property must be set accordingly to reflect the choice. Implementations that are unable to provide all three angles must set the values of the unknown angles to null. If any angles are provided, the absolute property must be set appropriately. If an implementation can never provide orientation information, the event should be fired with the alpha, beta and gamma attributes set to null. The deviceorientationabsolute event and its ondeviceorientationabsolute event handler IDL attribute have limited implementation experience. User agents implementing this specification must provide a new DOM event, named deviceorientationabsolute. The corresponding event must be of type DeviceOrientationEvent and must fire on the window object. Registration for, and firing of the deviceorientationabsolute event must follow the usual behavior of DOM4 Events, [DOM4]. User agents must also provide an event handler IDL attribute [HTML] named ondeviceorientationabsolute on the window object. The type of the corresponding event handler event type must be deviceorientationabsolute. The deviceorientationabsolute event is completely analogous to the deviceorientation event, except additional sensors like the magnetometer can be used to provide an absolute orientation. The absolute property must be set to true. If an implementation can never provide absolute orientation information, the event should be fired with the alpha, beta and gamma attributes set to null. The compassneedscalibration event and its oncompassneedscalibration event handler IDL attribute have limited implementation experience. User agents implementing this specification must provide a new DOM event, named compassneedscalibration that uses the Event interface defined in the DOM4 Events specification [DOM4]. This event must fire on the window object. Registration for, and firing of the compassneedscalibration event must follow the usual behavior of DOM4 Events [DOM4]. User agents must also provide an event handler IDL attribute [HTML] named oncompassneedscalibration on the window object. The type of the corresponding event must be compassneedscalibration. This event must be fired when the user agent determines that a compass used to obtain orientation data is in need of calibration. 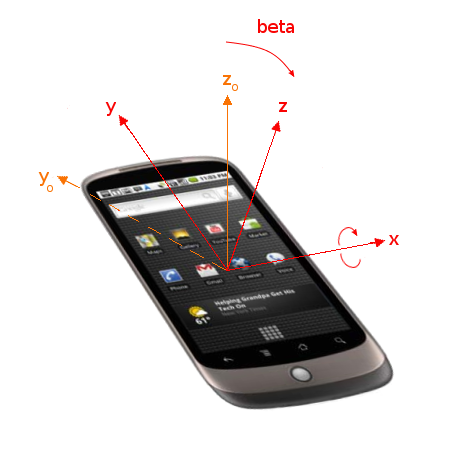 Furthermore, user agents should only fire the event if calibrating the compass will increase the accuracy of the data provided by the deviceorientation event. The default action of this event should be for the user agent to present the user with details of how to calibrate the compass. The event must be cancelable, so that web sites can provide their own alternative calibration UI. User agents implementing this specification must provide a new DOM event, named devicemotion. The corresponding event must be of type DeviceMotionEvent and must fire on the window object. Registration for, and firing of the devicemotion event must follow the usual behavior of DOM4 Events, [DOM4]. User agents must also provide an event handler IDL attribute [[!HTML] named ondevicemotion on the window object. The type of the corresponding event handler event type must be devicemotion. The acceleration attribute must return the value it was initialized to. When the object is created, this attribute must be initialized to null. The accelerationIncludingGravity attribute must return the value it was initialized to. When the object is created, this attribute must be initialized to null. The rotationRate attribute must return the value it was initialized to. When the object is created, this attribute must be initialized to null. The interval attribute must return the value it was initialized to. When the object is created, this attribute must be initialized to 0. If permission is "default", ask the user whether sharing device motion for the relevant settings object’s origin is acceptable. If it is, set permission to "granted", and "denied" otherwise. The acceleration attribute must be initialized with the acceleration of the hosting device relative to the Earth frame, expressed in the body frame, as defined in deviceorientation Event section. The acceleration must be expressed in meters per second squared (m/s2). Implementations that are unable to provide acceleration data without the effect of gravity (due, for example, to the lack of a gyroscope) may instead supply the acceleration including the effect of gravity. This is less useful in many applications but is provided as a means of providing best-effort support. In this case, the accelerationIncludingGravity attribute must be initialized with the acceleration of the hosting device, plus an acceleration equal and opposite to the acceleration due to gravity. Again, the acceleration must be given in the body frame defined in deviceorientation Event section and must be expressed in meters per second squared (m/s2). The rotationRate attribute must be initialized with the rate of rotation of the hosting device in space. It must be expressed as the rate of change of the angles defined as alpha (x axis), beta (y axis), gamma (z axis) and must be expressed in degrees per second (deg/s). The interval attribute must be initialized with the interval at which data is obtained from the underlying hardware and must be expressed in milliseconds (ms). It must be a constant, to simplify filtering of the data by the Web application. Implementations that are unable to provide all attributes must initialize the values of the unknown attributes to null. If an implementation can never provide motion information, the event should be fired with the acceleration, accelerationIncludingGravity and rotationRate attributes set to null. Further implementation experience is being gathered for the permission model and specification clarifications informed by this experience are being discussed in GitHub issue #74. This means the user does not want to share device orientation or motion. This means device orientation or motion may be shared. Additionally, implementing these items may also have a beneficial impact on the battery life of mobile devices. A gaming Web application monitors the device’s orientation and interprets tilting in a certain direction as a means to control an on-screen sprite. A Web application monitors the device’s acceleration and applies signal processing in order to recognize certain specific gestures. For example, using a shaking gesture to clear a web form. A mapping Web application uses the device’s orientation to correctly align the map with reality. The specification must provide data that describes the physical orientation in space of the device. The specification must provide data that describes the motion in space of the device. The specification must allow Web applications to register for changes in the device’s orientation. The specification must be agnostic to the underlying sources of orientation and motion data. The specification must use the existing DOM event framework. The following worked example is intended as an aid to users of the DeviceOrientation event. Introduction section provided an example of using the DeviceOrientation event to obtain a compass heading when the device is held with the screen horizontal. 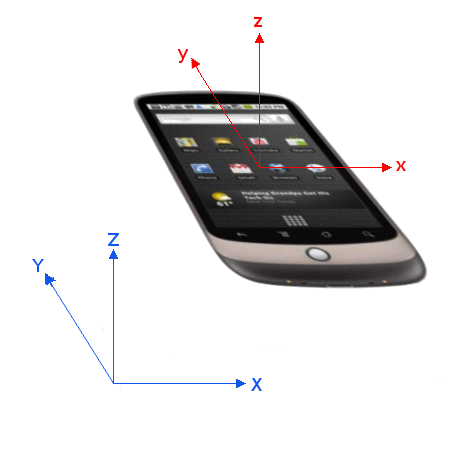 This example shows how to determine the compass heading that the user is facing when holding the device with the screen approximately vertical in front of them. An application of this is an augmented-reality system. More precisely, we wish to determine the compass heading of the horizontal component of a vector which is orthogonal to the device’s screen and pointing out of the back of the screen. If v represents this vector in the rotated device body frame xyz, then v is as follows. The transformation of v due to the rotation about the z axis can be represented by the following rotation matrix. The transformation of v due to the rotation about the x axis can be represented by the following rotation matrix. The transformation of v due to the rotation about the y axis can be represented by the following rotation matrix. If R represents the full rotation matrix of the device in the earth frame XYZ, then since the initial body frame is aligned with the earth, R is as follows. If v' represents the vector v in the earth frame XYZ, then since the initial body frame is aligned with the earth, v' is as follows. provided that β and γ are not both zero. Describing orientation using Tait-Bryan angles can have some disadvantages such as introducing gimbal lock [GIMBALLOCK]. Depending on the intended application it can be useful to convert the Device Orientation values to other rotation representations. The first alternate orientation representation uses rotation matrices. By combining the component rotation matrices provided in the worked example above we can represent the orientation of the device body frame as a combined rotation matrix. If R represents the rotation matrix of the device in the earth frame XYZ, then since the initial body frame is aligned with the earth, R is as follows. // ZXY rotation matrix construction. If q represents the unit quaternion of the device in the earth frame XYZ, then since the initial body frame is aligned with the earth, q is as follows.